This custom-designed birthday cake was for the boyfriend of a good friend. 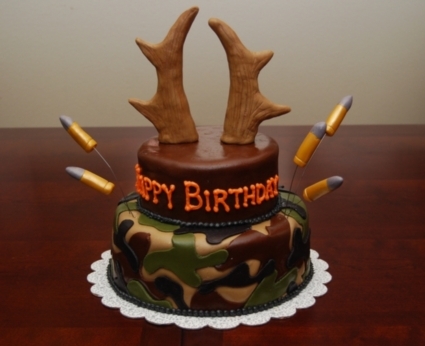 We had a blast coming up with a design that paid homage to his love of hunting. Everything is made of fondant. The bullets are flying on thin wire inserts. The antlers were formed around wood dowels, textured with a toothpick, and painted with cocoa powder to give some depth.